Every store owner should not think only about the front-end of the business, but set the base for CRM (Customer Relationship Management) capabilities in the back. 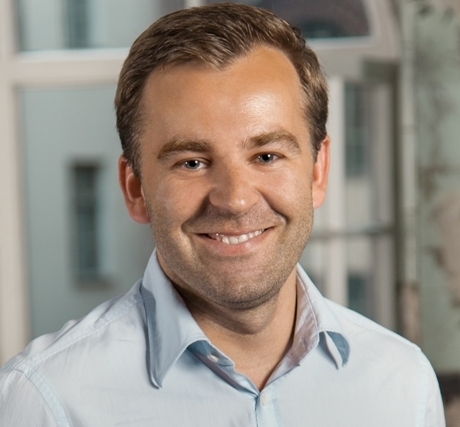 said Maciej Wyszynski - one of the international experts who will be speaker at TeCOMM eCommerce Conference&Expo 7-8 May, Bucharest. In Sociomantic Labs, Maciej is responsible for regional strategy, the sales strategy and development, and customer relations. In an interview with TeCOMM team, Maciej Wyszynski talked about the reasons of losing customer loyalty and how he sees the online trade in Romania. What are the reasons why some of the loyal clients give up on buying from some sites? How the online stores can keep loyal clients? Are there any strategies? For all types of customers, those who visited our store for the first time and those who are frequent and loyal users, the most important aspects of the purchase are positive emotions and satisfaction. These are two key components of the customer’s purchase journey and forms the core of customer loyalty too. Marketers can achieve this by focusing on investing in relations, delighting customers and answering to their needs. When they succeed in convincing consumers to return to the brand; to buy again, marketers can then move on to the next and last stage of the full funnel marketing model - Advocacy, in which the customer becomes the brand advocate and convinces others to make a purchase. 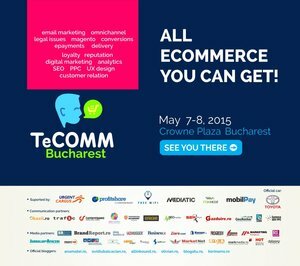 What do you think about the Romanian e-commerce market? Romania’s online industry as well as their e-commerce market has one of the biggest growth potentials in the region. Considering the fact that in 2014 Romanian online retail exceeded 1 billion Euro compared to 600 million Euro in 2013 (according to Romanian e-commerce players) and taking into account similar prognosis from this year, we can expect it to be very exciting. One must also not forget the fact that the Romanian market is one of the biggest in Central Eastern Europe. In 2014, the amount of Internet users in Romania exceeded 11 million. These two aspects combined generate a great deal of interest in the Romanian market among international e-commerce players. How was from your point of view 2014 for online sales in your country? At Sociomantic I am responsible for Central and Eastern Europe and have an opportunity to look deep into the e-commerce market in all these countries. The condition of a nation’s economy and politics has a substantial impact on the e-commerce industry and this is why we notice a huge diversity in markets condition across the CEE region. Some markets such as Czech Republic or Romania developed rather rapidly or like Poland, which is on a stable growth path. At the same time, countries like Ukraine are struggling amidst political and economical crisis or like Russia suffer from devaluation of the currency. 2014 was very diverse but I believe 2015 will be far more stable. Do you have any advice for online stores owners? Treat every customer with experiences that are personal and tailor-made for them and invest in them - because loyalty doesn’t happen on it’s own. Every store owner should not think only about the front-end of the business but set the base for CRM capabilities in the back. When you start to segment your users from the very beginning it will make your CLV strategy more successfull as you will be able to talk to your client on an individual basis. Think about internationalization of your e-business as this strategy can scale your business easily across the European Union. Finally, do not forget about mobile. 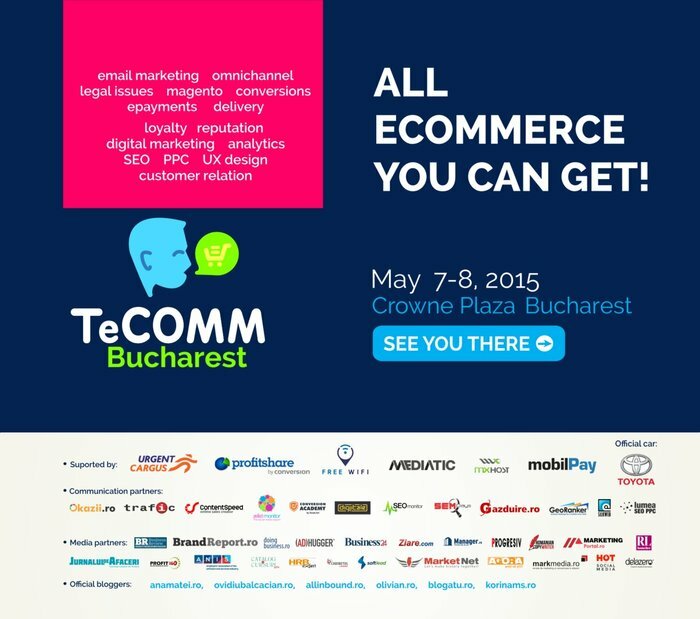 TeCOMM Bucharest will be taking place on the 7th-8th of May 2015 at Hotel Crowne Plaza. It is the first time when this conference is organized in the capital after four editions that took place in Cluj-Napoca and Iaşi. Up to now 150 speakers and over 1200 people have participated to TeCOMM. Day 1- 7th of May: Ecommerce Conference and RoMagento –there will take place presentations and debates about the latest tendencies and recommendations in this field and in parallel will be happening workshops for online stores developers which use the Magento platform. Day 2- 8th of May: Workshops and MarkDay: 12 workshops will be happening in parallel in two different rooms for the ones interested in SEO, optimization, CRO, analytics, conversion, logistics and trademark and 6 other workshops dedicated to the online marketers during MarkDay. More informations about the event you will find on: http://bucharest.tecomm.ro. Libero Events is an events agency that contributes, for over 5 years, to developing the Romanian business sector by creating an evironment encouraging the professional development, offering also unlimited networking opportunities. The agency has in portfolio TeCOMM, Touristica, The Woman, HR Summit, MarkDay, Software Architecture Day.